Footage of what happens on factory farms has horrified people in the past – so much so that several states have made it illegal to document livestock operations. But investigative journalist Will Potter hopes to get around the “ag gag” laws by using drones to photograph the farms from the air – and he needs your help. He’s currently raising finances to undertake the project so he can pay for the equipment, legal expenses, video production and other equipment he needs to make a short documentary, create an e-book and document abuses at factory farms. His Kickstarter campaign (which ends today) has already raised $48,000, with a promise to match all donations above $45,000. “I’ve been reporting so much on the ag gag laws and seeing that the political climate is getting worse and worse,” Potter told Fast Company. “I just got back from Australia and ag gag laws are showing up there as well. I wanted to think up ways to be more creative and ambitious.” He got his inspiration for using drones after seeing British artist Mishka Henner’s satellite views of industrial farm feedlots that showed toxic waste lagoons so big they looked like ‘wounds on the landscape.’ And while he knows drone footage won’t be able to show animal abuses up-close, he’s hoping to show similar environmental abuses to the ones Henner documented. Potter’s Kickstarter campaign has gained enough steam that it’s already starting to show up in livestock industry campaigns, and while not all coverage has been negative, Potter is “building redundancies” into his drone operations so that his project doesn’t go south if a farmer hears about it and decided to shoot down one of his drones – something that’s already been threatened on Internet forums. If the demand isn't there, the problem will fade away. Go vegan - you'll never regret it. Your health will improve, animals will be better off and so will the world. You will have the satisfaction of knowing that you made a difference to the planet. 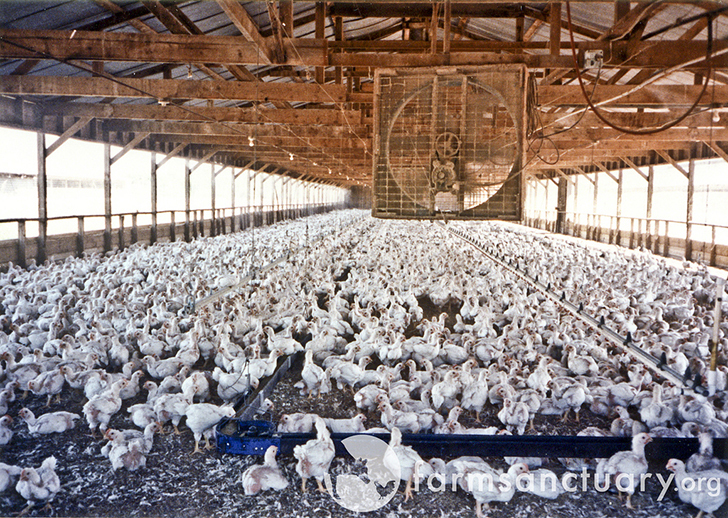 Chickens being raised for slaughter. A journalist wants to use drones to get around ag gag laws and film factory farms from the air.